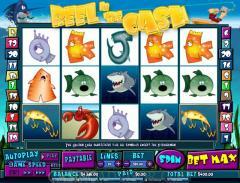 As the name suggests Reel In The Cash is a fishing theme slot. The reels loaded with various kinds of fish are set under water. Even without the reels spinning there is plenty of animation to see. Fish keep darting in front of the reels. Air bubbles flow from the bottom to the water surface. The Golden Lure is the wild symbol and Henry the Fisherman is the scatter symbol. The other creatures include the Swordfish, the Shark and the Lobster. There is a Worm tied to a hook. The high value cards from ten to ace have been innovatively crafted to look like different types of fish. All symbols bear a cartoon caricature look. In Reel In The Cash players have to wager only one coin per line. But they can enable up to 20 paylines by operating the appropriate plus and minus signs. All 20 paylines can be instantly enabled using the Bet Max button. The coin denomination range is quite large. It starts at 0.01 and goes up to 40.00, with over 30 options in between. 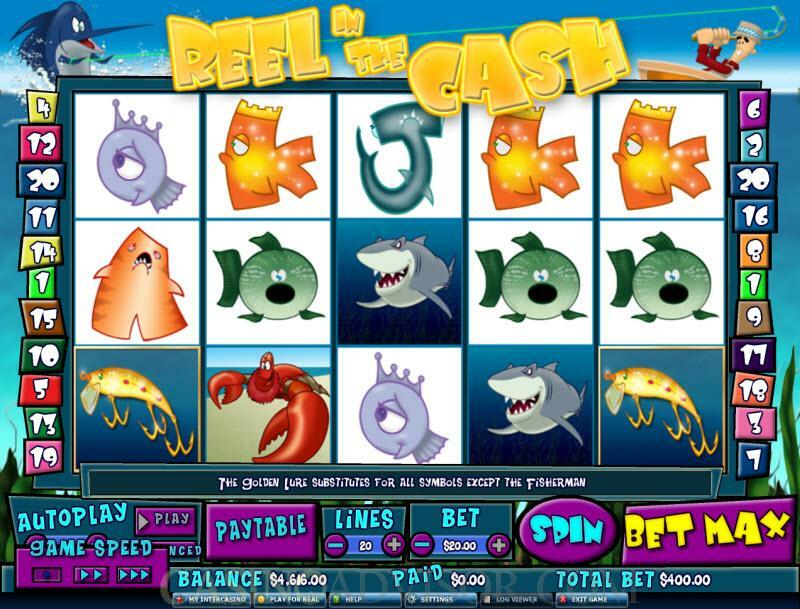 The slot game offers two advanced features. Players can set the game speeds from within the game itself. In the fastest speed the reels do not spin at all and the new settings are instantly shown. The auto play can be programmed to automatically stop at cumulative wins, cumulative losses and single wins. The Golden Lure is the wild symbol. It offers the maximum fixed jackpot of 5000 coins but does not multiply the payouts. The Fisherman is the scatter symbol. Apart from offering scatter payouts it triggers the bonus game on the second screen, which is known as Fishing Follies Feature. This is a simple game but executed well. When three or more scatter symbols appear on the reels water rushes over the reels and then recedes to reveal Henry the Fisherman in his boat. The player gets three casts of the line. Each time he first selects a lure out of five boxes that fixes his multiplier. He then chooses a fishing spot from the five offered along the coastline. On choosing the spot he is taken there. 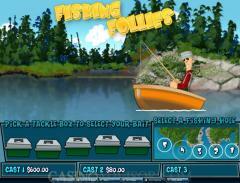 Henry casts his line and depending on the catch and the multiplier the player gets bonus credits. The best part of this bonus game is that even if the Fisherman catches useless items like boots and tires the player wins something. After all three rounds are completed Henry leaves a note thanking the player for partnering him. Interested in reading more detailed information about Reel in the Cash? If so Click Here for more details.